Though lifts just recently stopped serving snowriders—Snowbird kept winter going through July 4—Wasatch Front resorts still provide a variety of incredible offerings during summer and early fall. Aside from hiking and mountain biking, you can find mini amusement parks and thrill rides, great restaurants and enough concerts and action events to provide a resort vacation to meet everyone’s taste. Brighton is also a hiker’s paradise, with a number of quiet fish-filled lakes just a few miles up from the base area, and Silver Lake’s boardwalk and well trout-stocked lake just down the road. Do a nifty overnighter with friends or family at the Brighton Lodge, which comes with breakfast at the Brighton Store a short walk away; it’s just $38 per person, double occupancy. Watch the sun set while you soak in the glowing outdoor hot tub. As you walk back to your room, “Errol the Squirrel” will throw nuts at you from the roof. To book a room, call 801-532-4731 and press 3. Canyons is another mountain-biking and hiking paradise. You can bring your bike up on the gondola and find trails ranging from easy beginner level to advanced single track. If you’re lucky, you’ll find one of the herds of sheep that graze on non-resort property, with an actual vaquero or two keeping watch; they’re right out of a Western. Or, take a paddle-boat ride in the resort reservoir that supplies water for snowmaking in winter. The now-legendary farmers market returns to the Cabriolet parking lot every Wednesday. Deer Valley is still the queen of lift-served mountain biking, with well-maintained trails, guided ride tours and clinics and even bike rental available. The resort will have three lifts operating, but as of this writing, there’s still so much snow that riding is somewhat limited. Who cares? When it only costs $34 for an all-day lift ticket for you and your bike, even the most rabid rider will find enough single-track to be satisfied. Of course, there are also Deer Valley’s famous summer concerts and gourmet restaurants—definitely worth a couple of visits. Park City Mountain Resort has a mini-Lagoon in the base area, with the Alpine Slide (you can race someone); the new “ZipRider,” which is like a zip line; kiddie rides; and a new children’s section called the “Adventure Zone,” plus miniature golf. 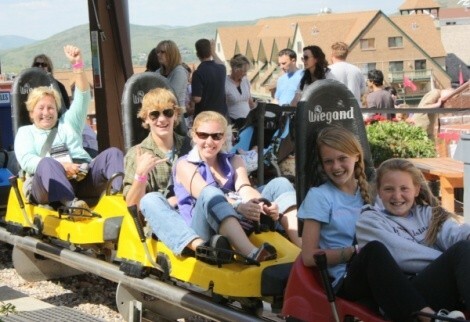 Of course, the killer ride is the alpine coaster, the only one like it in Utah. “There’s great lift-served hiking and mountain biking on both Payday and Town lift,” says new PCMR communications manager Andy Miller. He suggests biking to Main Street, then loading yourself and your bike on the Town lift. The lift lets you off near the top of the mountain, and you can choose your trail for the bike ride down. Every local resort offers something for summer, from Powder Mountain’s Aug. 20 Monster Energy PM Motocross (which will feature the world’s top riders, plus the resort’s “Powzilla,” a motorized scenic tour of PowMow’s more than 10,000 acres) to Snowbird’s great-for-schmoozing Plaza (with concerts every Saturday until Aug. 13, surrounded by attractions like the zip line, the alpine slide, the bungee jump and more). There are world-class triathlons at Snowbasin—where you can watch or participate—elegant dining at Sundance and much more that there’s no space left to include. Just remember: When it comes to the Wasatch, there’s no place like a snow resort for the summer.